It’s the year 2024. President Vladimir Putin is now 72. His sandy hair has thinned. But those icy cold blue eyes still transfix. This nightmarish vision had many Russian democrats tossing and turning in bed Saturday night. With the daylight, they woke up. Then, they remembered: it was not a bad dream, their nightmare was true! As if to rub it in, Nova Gazeta published a front page cartoon, showing today’s Russian cabinet, aged 12 years, looking like a Soviet politburo of old. Indeed it is back to the future, as today’s Kremlinologists study online biographies of Leonid Brezhnev and Joseph Stalin to figure out how long they ruled Russia until they died in their beds. (Answer: 18 years for Brezhnev and 30 for Stalin). 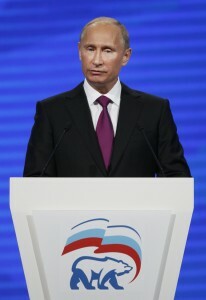 If Putin can pull it off (not a big if), he will win a six year term in presidential elections next March. In 2018, he could run for another term, which would take him to 2024. Unlike power shifts in the Soviet Kremlin, last week’s elite electorate was not the voting membership of the Politburo, historically about 14 barons of the Communist Party. Then in a closed door meeting, he broke the news to his protégé, Dmitry Medvedev. Under the deal, he promised to make Medvedev his prime minister next May. Thus in a backroom deal, the leadership was decided for the next decade of Russia, a country of 141 million, the world’s largest energy producer and the holder of the world’s largest arsenal of nuclear weapons. Short term, it all should work because public opinion polls show Putin as the most popular politician in the country. Control of television, controls on political opposition, and controls on vote counting, all help embellish his natural charisma. Adding a democratic tone to the proceedings, the Putin-Medvedev job swap plan was unveiled at a congress of Russia’s ruling United Party. The congress immediately rubber stamped it. Putin is an expert at keeping his counsel. Close associates were clearly caught off guard. On a visit to Washington, Alexei Kudrin, Russia’s finance minister for 11 years, was evidently so miffed about being passed over for the prime minister job, that he announced he would not work for the new government. 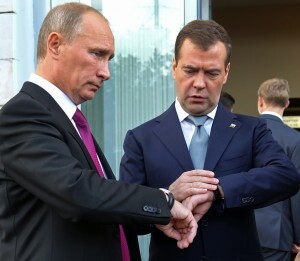 In an unexpected display of force, President Medvedev told him on Monday that he had until sundown to quit or stay on. By the end of the day, Kudrin, the pillar of Russian financial planning since 2000, was gone. Russia’s stock markets and exchange markets continued their fall, hitting two year lows. Factoring in the Kudrin exit, economists now estimate that Russia’s net capital flight this year will hit $70 billion. And a brain drain may follow the money drain. Seeing crony capitalism and unchecked corruption as a dead end, half of Russian university students and half of Russian business entrepreneurs told the Levada polling company in August that they want to emigrate. It is no wonder that one of the Kremlin’s top issues with the European Union is visas. Cuba and Belarus show that authoritarian regimes are much easier to maintain if the malcontents just leave. Putin’s coronation of himself speaks volumes about how a cult of personality is supplanting institutions in today’s Russia. A former KGB officer in East Germany, Putin has long maintained an authoritarian’s distrust of elections. Making no secret of his low expectations, he seems to see Russians as political teenagers, people who are not yet mature enough to elect their own mayors, governors, and presidents. By pruning back civil society, he retards a natural growth in citizenship. Defenders of the system correctly say that Russia’s history gives little hope that democracy can take root here. But they twist uncomfortably in their seats when reminded that the same could have been said of nations as diverse as Taiwan, Brazil, South Korea, Spain, Poland, Mexico, Serbia and Japan. In recent decades, all have moved beyond authoritarian systems to create multiparty democracies. In that tapestry of societies, the common change agent was a middle class that grew to the point where it reached a critical mass. Russia is moving steadily in that direction. Already half of Russia’s adults go online, with millions turning to the largely unfettered internet for their news and views. About 15 percent of the population is expected this year to go on a foreign vacation. Car ownership levels are rapidly catching up with Western Europe. Successful autocrats work themselves out of their jobs. Those who overstay their leave risking ending up like Alberto Fujimori, the former president of Peru. Fujimori, a politician I have interviewed many a time, decided to go for a third term. He now sits in a jail cell near Lima serving 25 year sentence for human rights violations. Behind the growth of Russia’s middle class is the stability of the Putin decade. After a disastrous century of revolution, famine and war, Putin became president in 2000. He delivered a golden decade. In 10 years, the economy grew by 60 percent, unemployment dropped by one third, real salaries tripled, the debt to GDP ratio dropped from 58 percent to 12 percent, and oil production increased by 56 percent. Putin was no miracle worker. He simply provided stability. Strong international oil and gas prices did the rest. Now, oil and gas account for two thirds of Russian export earnings. Coal, iron, gold and other minerals and metals account for most of the rest. But another world recession — or a pause in China’s headlong growth — would push down commodity prices, plunging Russia’s economy into crisis. Before he quit as finance minister, Kudrin was the Kremlin’s Cassandra. Two years from now, he warned recently, export prices for Russia’s oil will slip to $60 a barrel, from $106 today — well below the $110 level needed to balance Russia’s swollen budget. In the political field, the price of economic stability was Putin’s “soft” authoritarian political system. Most Russians are not economic stakeholders in their government in the Western sense. In American terms, Russia is like Alaska — residents are paid to live there. Each year, a portion of Alaska’s oil and gas bounty is divided up and mailed out in the form of checks to bona fide residents who made it through the winter. With Russia’s flat 13 percent income tax, the Kremlin gets the bulk of federal funding from 15 companies – largely oil and gas producers. Marginalized from the political arena, most Russians retreat into their personal spheres, channeling energies into places where they can make a difference and get a real benefit — family, friends, work and travel. In this depoliticized atmosphere, a protest was held the day after Putin unveiled a roadmap for his own rule of Russia through 2024. The protest was held at Pushkin Square, a confluence of three subway lines. In this city of 12 million, the rally drew about 250 people. The next morning, the most widely read story on the Ria Novosti Internet news site was not about Russia’s political leadership. It was about a Federal plan to allow the industrial cultivation of hemp, also known as cannabis sativa, or marijuana. Will you still love me when I am 72? 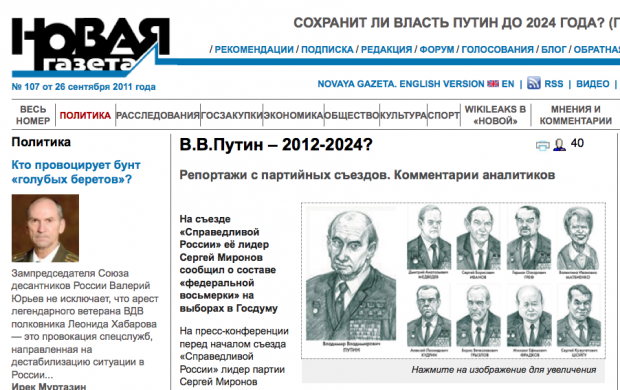 Novaya Gazeta, a Russian opposition newspaper, aged Vladimir's Putin team, bring them to 2024, the constitutional presidential term limit for Russia's strongman, Vladimir Putin. Looks like your worst nightmare is about to happen! What are you going to do now, you sorry losers? Unfettered Internet is no more in Russia for those willing to comment on the clowned politics in Russia. Immediately after I’ve posted for the BBC on this self-appointment my access to BBC site through my fibre-optic connection has broken. And it goes on for 24 hours now. but broken by FSB Yeltsin would nod “Yes” for this development. The only one explanation for this sudden change of Yeltsin maybe the following: to seize power and force Yeltsin-democrat to resign by blackmailing him with prison for “stolen” from him top-secret documents, caught on a camera bribe, prostitutes or something else was the most successful FSB operation. Who knows the secret and can provide better reason for the great metamorphose? чтож вы так боитесь этого клоуна? понятно,что вас устраивал реальный клоун–вечно пьяный ельцин,совершивший перевороты в 91м,93м,96м годах. и нникакого шантажа,никаких усилий ФСБ,которую он развалил. просто в минуту редкого протрезвления он понял,что лучше уйти самому,пока не поздно. As has been pointed out Yeltsin was the last democratically elected president. He was elected the American way. A dozen non-Russian Russian oligarchs blitzed the unaccustomed Russian population with American-style propaganda, Yeltsin was elected and the oligarchs were given Russia’s resources as a thank-you gift. One of them received 6% of the world’s oil reserves for free. Actually I correct myself. There was a “tip” payment which was less than the price of one of Donald Trump’s mansions. But do we really want to impose the American political system on China and Russia? Do we want them to have the Democrat and Republican thing, with lobbyists, banksters etc.Not to mention soup kitchens. Would China’s amazing progess have been realised if they had the American system? To suppress discontent of those unhappy with the cynicism of the self-appointment and the “job-swapping”, the regime introduced fettered Internet in Russia. Now international TV channel “Russia Today” began gagging “unfriendly” posts on their articles for the recent development in the country. Although my post in “RT” passed all security checks under the relevant article and I got “thanks for posting” it didn’t pass moderation. I chanced to post my disapproval of President Medvedev’s, who now heads the United Russia election list in the parliamentary election on December 4, abstaining from forthcoming political debates. Every party leader anywhere in the world is capable to face political opposition and to demonstrate strength of his/her political arguments in public. But not in Russia. 1. opinions of potential voters does not mean the United Russia a thing – the result of the forthcoming election already known. Voters are worthless. 2. it is obvious: the ruling party in Russia ignores this worldwide rule for known reasons – nothing to show off either in freedom of speech and public gatherings, nor in economics, education, healthcare, fighting depopulation of the country. 3. Head of the United Russia election list isn’t ready or afraid to face opposition in open public debate. The Russian people are very satisfied with their goverenment . Yelsin and his unstable democracy were thrown out of Office when NAZI/NATOs dismembered Yugoslavia . The Orthadox church and the most powerfull man in Russia , Aleksander Solhenitsyn , selected Putin to strengthen Russia in 2000 . The stupid US general Wesly Clark , the commandor of all NATO forces , issued orders to shoot the Russian soldiers . NATO forces refused the order . After we had given little Georgia 4 billion dolars of aid . They decided to use this aid to subdue South Ossettia . 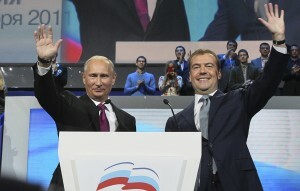 Russia’s new president Medvedev , did not consult with NATO or the U.N. Russia rersponded with out hessitation . If NATO or anyone else wanted to come and dismember Russia by way of the Black sea , they were welcome to come right ahead . The world than said huh ” THE BEAR IS BACK “. Some people judge a country by number of T.V. sets , healthcare , moderen infastructure , I judge them by the ability to stand up for whats right . I believe Aleksander Solhenitsyn would be very proud of Russia now . If Soljhenitsyn were proud of Russia today I would stop respecting him. Russia inability to turn into a full blown democratic nation is making it look as bad as any third world country experiencing similar leaders-love-power syndrome, which is true as recent United Russia party gathering indicates. Russia is technologically a superb nation with resource endowed geography, but politically vis a vis economical liberalization is making it simply an impossible place to be more and live with sigh. Russians are most informed people by comparison, but they are limiting themselves to one simple idea, stability, which is the same idea African dictators give when they are challenged with facts. The question in the next presidential poll is, will Russians reject and unite against power under one party or will they give in and limit themselves to one party rule? March 2012 will be either sink or swim test for Russians, where sink is remaining under one party rule and swim is changing the course of their direction to embracing new vision. James, thank you for the exellent article! Great job! I will try to follow your blog until the crazy kgb colonel finally establish the new Iron Curtain which is his pet dream I bet. True Pyotr Yelstsin was more of a democrat . The NAZI/ NATO bombing of Belgrade could have just as well been on Moscow . It had the same affect . Yeltsin democracy was done in by the United States bombing of the Orthadox christians in Serbia . 80 yrs of athiestic communisim rule did not leave enough morality in Russia to run a moral democracy . A democracy is dependant on self rule . Without a strong moral foundation of whats right and wrong a democracy can not flourish . Putin promised the orthadox church and Solhenistyn to return Russia to her historic Judo christian roots . In his first 6 yrs of office Russia built more the 30 thousand christian churches . Russia has not only been selling raw energy and raw materials . Russia has been selling top guality weapons all over the world . they even have sold US helicopters for afganhistan . I really don’t know what Putin is or is not , but I believe Solhenitsyn was a very great and good man and he spent considerable time studying how to run a goverenment , or maybe how not to run a goverenment . He was here in the United States for a while after he was expelled from Russia . If I recall correctly he was not over excited about how we do things always either . Eric Siverson, what on earth NAZI has to do with the bombing of Belgrade? I know that Allies once bombed NAZI Germany. Yeah, it was surely painful for the German nation, but it really did them good, now Germany is the third or forth world’s economy. And Stalin’s Russia deserved bombing and trial as well. Serbians are now free from their dictators and heading to be a part of civilized world. What’s bad in that? Tell me. Morality has nothing to do with religion imho, especially when religion is used as a corner stone of a nation. The Orthodox Church top and middle figures are the richest people, the Orthodox church in Russia is a big corporation producing many goods including vodka and cigarettes and not paying a copeck of taxes because Putin allowed them to be free from taxing in return for their loyalty. Yeah, churches are popping out like mushrooms in Russia when kindergardens, schools, hospitals, libraries are closing down. 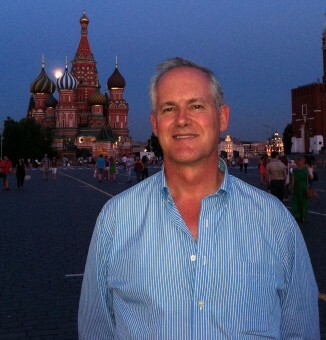 Russia is selling top weapons, I doubt their quality, I once worked on a military plant. So it sows the seeds of future wars. What does Bible says about that? Yes, Soljhenitsyn was great, but not because he was a religious man. I consider him great because he called to Russians to build their society on truth, not on lies the communist regime had been built on, and he was not afraid to show those lies. I am not a big fan of American style democracy either. Democracy is bad, but it is the best what we’ve got! And they always run out of money , thats how they get elected . So when the money is gone the elections are over for the true socialists . Germany attack Yugoslavia three times in the last century . Russia always made good weapons . The Russian tank was the only tank that could stand up to the German tiger tanks in WW2 , Remember the mig fighter plane and the AK47 machine gun . Have you seen Chinia’s new aircraft carriarer . It was built in Russia . A couple of yrs ago at the Bangalore India air show . A russian fighter plane equiped with Israeli elctronics flew circles around evreything in the sky . Russia has been filling orders for their planes . Even United States has considered purchasing Helicopters for their war in Afganhistan . I watched the trail of Milosevic , I don’t think he was guilty of one single crime , I would have not called him the butcher of the Balkans . I believe he was the first democraticaly elected leader of Serbia and not a dictator . I do think the elected leaders of Both Bosnia and Croatia were once members of the old nazi party . The nazi/ NATO attack on Yugoslavia was more a crime than a response to a humanitarian crisses . Almost no truth can be found in any of the charges against the Serbs in this war . Nato just lied like the Nazis . The only place I can find the truth is in Russia . You said you thought Solhenitsyn was a man of truth , I have not noticed many lies coming out Putins goverenment either . I would like to learn of a few . I figure you maybe a Russian , I have some friends from Russia , They say Russia was bad . But they left during Kreuchefs time . I’am Hoping Putin is better . It was not the russian tank that could stand up to German Tiger, that was russian soldiers. Russia lost way many soldiers in WWII than Germans did. Jhukov, the war general, was a butcher, he never counted lost lives of his own people. Russians have won the WWII only because they had been a numerous nation, and the weather of 1941 winter had been extremely cold. Truth to say, I figure you may be a Russian, “Eric”. If so, don’t fool people around here and say your real name and your fsb rank. If not, I am sorry, your hoping is really really wrong, Putin’s worse. Seriously, in 2011 does anyone want to see a model of a “democracy” with one set of highly-disregarded set of “representatives” replacing an equally unremarkable and hated set of “representatives” whilst the really powerful people are banksters, ethnic media-owners, lobbyists etc, presided by a notional elected leader who is beholden to people whose hundreds of millions of dollars made his election possible. I think on any independent assessment Putin has been good for his country and is popular with his countrymen whilst, say, the US’s recent leaders and “representatives” have not been good for their country and were/are not popular. I wouldn’t call the bombing of German cities an act for the German’ own good. I call the roasting of hundreds of thousands of German civilians mostly women and children a criminal act and the destruction of beautiful cities as robbing me (with not a drop of German blood) of my European heritage. I similarly regard the admittedly lower-level bombing of Serbian cities as bad, and moreover the creation of a Mafia state whose leaders even trade in human organs as a criminal act. And like many Europeans I am coming round to understand that ” a full-blown democratic state” means a group of politicians with their own personal agenda replacing another group of politicians with their own personal agendas mostly disregarding the wishes of the population and for whatever unmentionable reasons allowing millions of unskilled, unneeded and unwanted Muslims and Africans to take over big chunks of their cities, annoy their womenfolk, and seek to impose their Third World customs and beliefs on the host country. And a full-blown democratic state has also become synonymous with little growth in GNP. After the “democratisation of Russia” which to Russians really meant the transfer of Russia’s wealth from the State to a dozen or so non-Russian Russian oligarchs and the pauperisation of education, health and other essential services, Putin’s government was a huge, huge tonic. Eric & Marco certainly work for the FSB by fooling the world with Mr Putin’s admirations for 11 years him in power. I wonder, how much do FSB pay for such slander and ignorance on Russia’s problems in human rights, suspended Constitution, stagnant economics, numerous tragedies on transport, crash of one of the largest hydroelectric power station. The “tandem” has ready-made words of “condolences” and days of national mourning announcing, denouncing somebody’s greed, but their own inaptitude to govern, but the lawless environment they have created and endorse. Mr Putin looks unable to stop depopulation of the largest country in the world, poverty of 90% population while sell-off of natural resources is in full swing. Once one the best school education in the world under his rule is decrepit. Hospitals and clinics filled with drunken doctors and falling apart. Majority in the Putin’s Government are unprofessional. An accountant rules all healthcare of Russia denouncing medical professors, but very competent finance minister is dismissed. how about the farce of the tandem’s» swopping jobs? Have you ever seen anything of the kind in the world? You should see nowadays all windows in cities plastered with Putin’s face and his “promises”. His face watches lonely passer-by from every corner in every street. What is remarkable, everywhere he is in informal black T-shirt. Looks the same as Hollywood uses in gangsters movies. And no other faces. Yeah, Marco, you’re right, tonic. But too much tonic can cause some serious health problems, especially with digestion. I am personally fed up with Putin and his goverment, imho Russia really needs a change, though many russians still believe it is because of Putin we don’t have poverty of post perestroika period. Well back then barrel of oil hardly costed 10 dollars. Do I need to explain why Putin doesn’t want to give up power now?